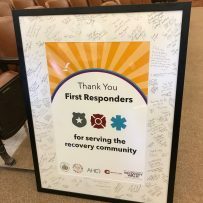 As a way to thank the County for supporting the recovery community, ACCR wanted to present County council with a framed poster. 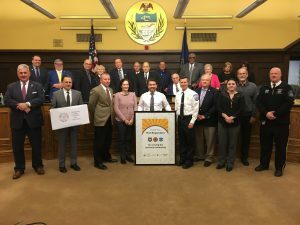 To this end, we were awarded the opportunity to gift the poster to County Council on Tuesday, April 10 in the presence of council members, people from the County’s first responder’s team, and community members. Many thanks to Ken Varhola, Chief of Staff for County Council, for assisting us in helping make this possible! ACCR recognizes the challenges and concerted efforts our First Responders make on a daily basis. We especially recognize this in light of the current opioid crisis our community is facing, and wanted to provide an outlet where County residents can say “Thank You.” While there is still much work to be done, we recognize there is a good bit of positive work taking place and ACCR was glad to recognize it with this thankful acknowledgement.